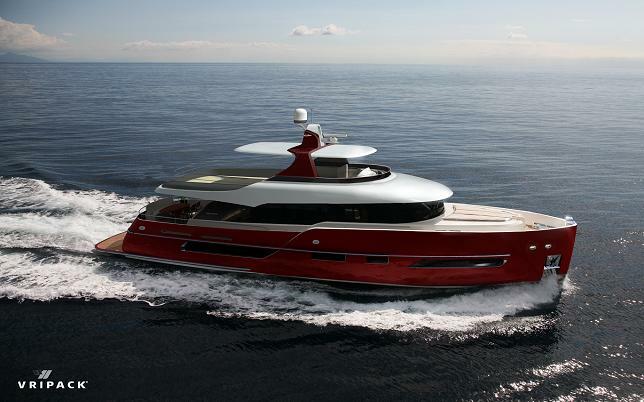 Italian based Gamma Yachts launches it’s latest model at the Hainan Rendez Vous April 5th-8th. The Gamma 24 Mediterranean is the bigger sister of the trendsetting Gamma 20. All Gamma’s are designed and engineered by Dutch renowned Naval Architect Vripack. Guido Bonandrini of Gamma Yachts is thrilled with this new semi-custom yacht, "This is a very special moment for our company and we selected the best place we could imagine to show her to the world. Asia is one of our target markets and it is only fit we treat them with respect and give them our premier showcasing." Designer Pim Dijksman for Vripack explains the main features, "We gave the Gamma line a very remarkable sight with the double curved sheer, so the Gamma 24 Med got that as well. Furthermore we extended the flybridge to give the large aft deck full sun coverage and at the same time enlarge the fun space on top. The huge open plan layout her sister is kept as well as is also the innovative crew cabin in the front. And due to the hinged swim platform her overall length is actually 27-meters"
"Another important item we kept is the custom design of the clients interior by Vripack’s Design Studio" informs Guido Bonandrini. "Together with the yacht the client receives a complimentary plane ticket to fly out to their rich material LAB and designs the interior with them. This is the Gamma way of having our customers connect with their yacht straight from the drawing board." With her Dutch-Italian lines, custom interior and European craftsmanship the Gamma 24 Mediterranean is poised for success in the year of the Water Dragon.